Even though I've only read the first part of this four part series, I am already completely in love with it. 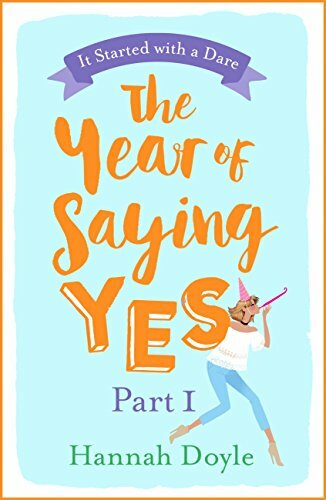 The Year of Saying Yes, Part 1, is a breath of fresh air, that made me laugh and smile the whole way through it. While I would have loved to have been able to sit down and devour all four parts of this story in one go, I am happy in the knowledge that I have three more installments of this little gem to enjoy in the future. In Part 1 of The Year of Saying Yes, we meet Izzy, who finds herself spending every New Year writing down the same list of resolutions and never actually seeing them through. This year she is determined to stick to her resolutions and she plans on doing this by saying Yes to new experiences instead of saying no to things. With this in mind, she sees a way that she can forward her career while sticking to her new year resolutions. Each month Izzy will be set challenges by members of the public that will see her say yes to something that she would not otherwise have done. Part 1 of the series sees Izzy complete these challenges for January, February and March. I can't remember the last time that I enjoyed a story or a character as much as this one and I was disappointed that I had to stop reading after part 1. I can't wait to get my hands on the next three installments of this story, so I can catch up with Izzy and find out what she did next. Hannah Doyle has really made an impression on me, as she pulled me into the story and kept me thoroughly entertained throughout with her effortless style of writing, that was also laugh out loud funny. 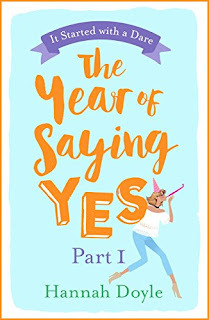 The Year of Saying Yes is a perfect pick me up read for these long, dreary January days and will put a huge smile on the readers face. I really can't recommend this series enough and I am so looking forward to getting my hands on the next three installments. I read a lot of books in this genre and a lot of them can be hit and miss, but what I have read of this series so far has made a huge impression on me and I will telling anyone who will listen to me, just how great this story really is. I would like to thank Frances at Headline for sending me a copy of this book in return for an honest review.